While I was out looking for autumn colors, I came upon lots of Halloween decorations of my neighbors. Since today is Halloween, I thought I would share some of them with you. 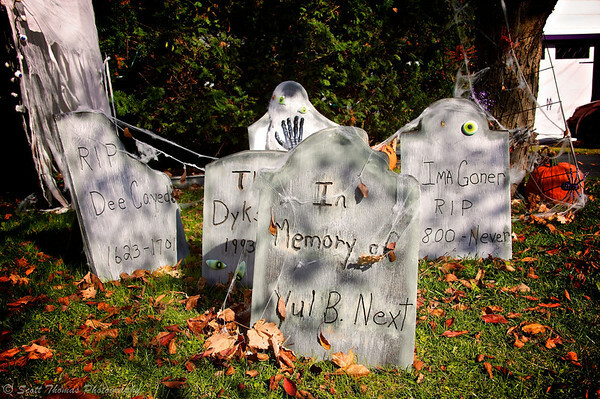 Graveyard of funny epitaphs in front of a house in Baldwinsville, New York. Nikon D700/28-300VR, 1/125s, f/13, ISO 200, EV +0.6, 38mm focal length. The funny epitaphs on these graveyard tombstones reminded me of the Pixelmania Tombstone I had made for me. 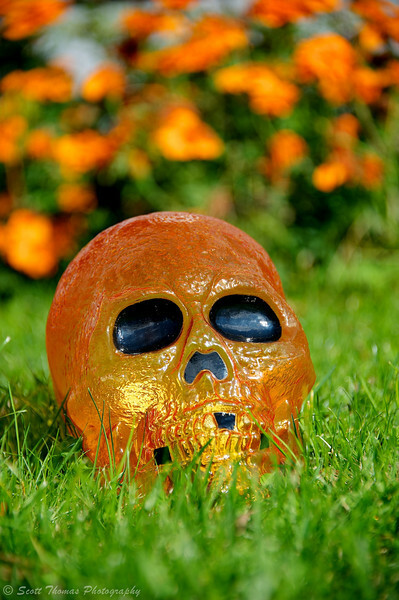 An orange skull rises out of the ground outside a house in Baldwinsville, New York. Nikon D700/28-300VR, 1/500s, f/5.6, ISO 200, EV +0.6, 190mm focal length. I got down on my stomach to give the orange skull popping up out of the ground a proper perspective. It was nice of the home owner to plant orange flowers in the background, wasn’t it? 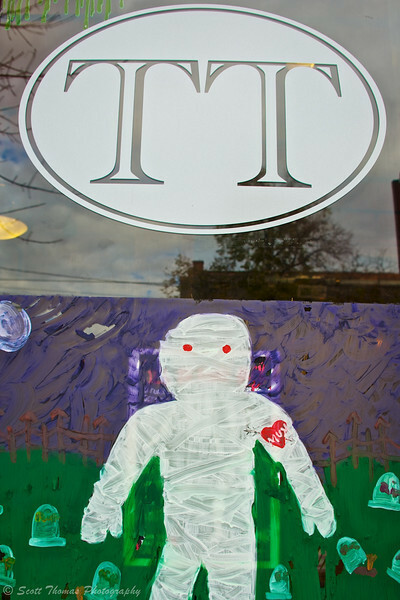 Halloween Window Painting on a tattoo parlor in the Village of Baldwinsville, New York. Nikon D700/28-300VR, 1/160s, f/6.3, ISO 200, EV +0.6, 28mm focal length. The annual Halloween Window Painting had taken place earlier in the day. I thought this young artist did very well by adding a tattoo on the painted Mummy. You see, the window belongs to Tymeless Tattoo, a tattoo parlor in the Village of Baldwinsville. 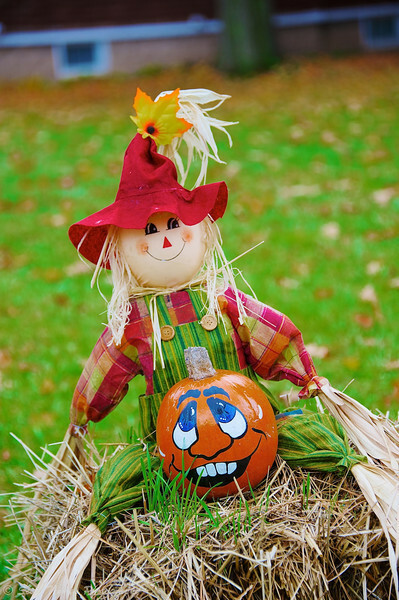 Happy Halloween lawn decoration in Baldwinsville, New York. Nikon D700/28-300VR, 1/125s, f/5.6, ISO 320, EV +0.3, 116mm focal length. Not all the decorations were attempting to be scary as the smiling scarecrow and pumpkin sitting on a bale of hay I found attests to. Here’s to a safe Halloween to you all and may your evening to be full of treats and no tricks. This entry was posted in Travel and tagged 28-300mm, baldwinsville, decorations, graveyard, halloween, holiday, lawn, mummy, new york, nikon D700, orange, painting, pumpkin, scarecrow, skull, tattoo, tombstones, tymeless tattoo, vr, window. Bookmark the permalink. I feel like poor Halloween took a back seat to a storm again, just like last year, although my area was thankfully spared this time around. I do like the funny gravestones. Reminds me of standing in line outside the Haunted Mansion at Disney. Glad Sandy sparred you this time. Halloween went off in my town without a hitch. Still, no where near the number of kids as when I was young. Same to you, Kathy! Halloween seems to get lost in the ever expanding sphere of Christmas commercialism and safety concerns. It is a fun holiday where people can let go without the pressure of the late year holidays.